It�s hard to imagine the seemingly unending wealth of treasures that is China…a land of diverse cultures, wise and peaceful religions, awesome natural wonders, people of astounding talent, and a history that is older than records. Politics aside, China is awesome! So it was with great anticipation that I boarded China Southern Airlines flight 300 to Guangzhow (previously known as Canton) on my way to Chengdu, the capital of Sichuan Province. 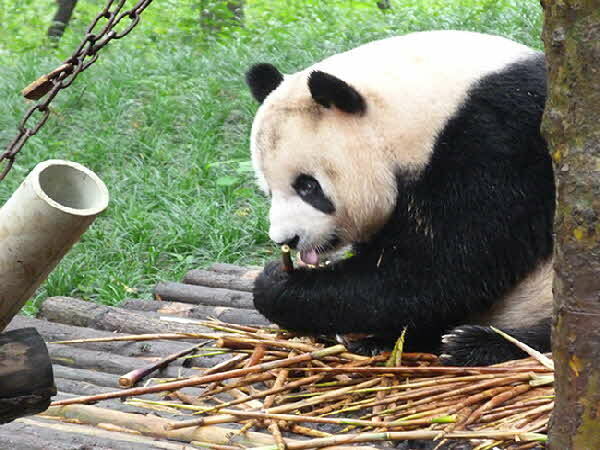 Sichuan, in central south China, is renowned for its spicy cuisine and splendid natural wonders… not to mention a Giant Panda Research center. Our first order of the next day was a visit to the Panda base. With less than 2,000 panda bears living in the wild, the facility was founded in 1987 for research and protection of this precious endangered species. The panda is part of the bear family and despite its cuddly adorable appearance, it is an unpredictable wild animal and viewing areas are strictly controlled. 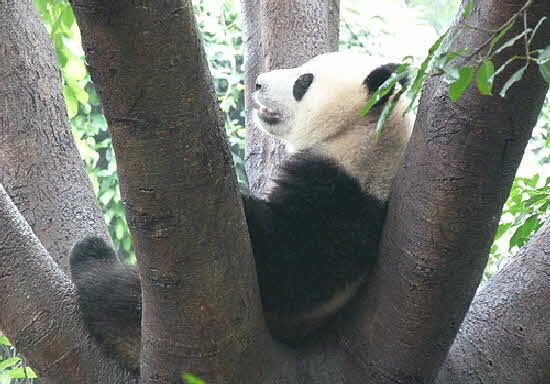 The panda spends its time eating bamboo shoots and sleeping - due to the low nutritional value of its diet the panda sleeps a good deal of the time when it’s not eating. Pandas are not social animals. In the wild they only come together to mate but in captivity there is no competition for food or mates so they are a bit more sociable. Nevertheless, each panda has its own enclosure and their interaction is closely monitored. The panda has 6 fingers; well, a thumb and 5 fingers, and lives around 25 years but more in captivity. In 1867 a French missionary “discovered”�� the “new”�� species and it was quickly recognized as the world’s cutest animal. Six cubs were on display behind glass and were fast asleep when we visited but we were able to catch a few adults still eating and entertaining themselves and us. 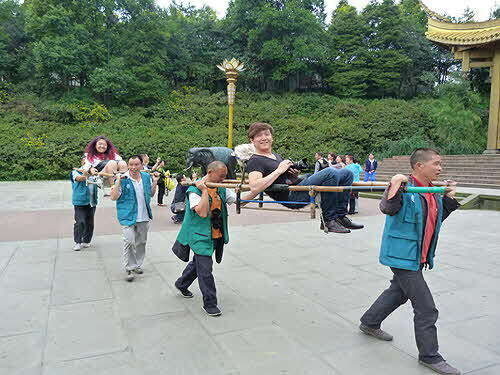 After a massive lunch of some 22 Sichuan specialties served family style (dishes piled high on a central lazysusan and everyone helps themselves) we walked to the famous Wuhou Temple Complex to view the super sized statues of Emperor Liu Bei of the Three Kingdoms period (A.D. 220 - 280) and his court. The layout of Temple Complexes include several individual buildings housing statues of religious figures, Emperors, Generals and other dignitaries along with gardens featuring flowing water, ancient shapely trees, large rock formations and landscaped walkways connecting the various buildings. We were reminded that we were visiting houses of worship for locals and pilgrims and cautioned to be respectful and not take pictures of sacred icons or people at prayer. 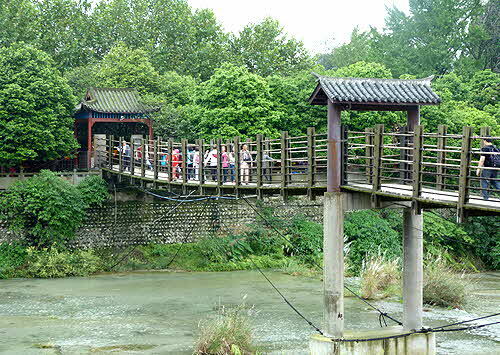 From Wuhou it is a short walk to the Jinli Street Folk area. The ancient street is one of the oldest and busiest streets in Chengdu. It is filled with artisans plying their wares; treats from carts; and souvenirs for sale. When I heard we were going to visit Dujiangyan, the world’s oldest grand water conservancy project built in 256 BC, I was curious as to what attraction this project would hold for tourists. Well I found out! The city of Dujiangyan looks like a Hollywood set of old China -- it is a fantasy but a remarkably appealing one. Many of the buildings are original but after a devastating earthquake some years back the ones that were damaged were rebuilt to maintain the “look”��. Spend some time wandering through the streets before heading out to the UNESCO World Heritage sites of the water conservancy and Qingcheng Mountain. By using the natural topography, the engineer Li Bing and his son some 2,200 years ago, devised an irrigation system that would tame the mighty River Minjiang and control the devastating annual flooding without having to build a dam. It is a monumental construct of outstanding creativity, re-channeling the forceful river at a time when the only technology was picks and shovels. A rope bridge is slung across the river to enable access to the many temples carved out of, or built into, the mountainside and while we did not have time to climb the mountain and explore these temples we did cross the bridge holding on for dear life. Apparently it is good fun to make the bridge swing and to avoid flying off; it is advisable to hold tight. As a seasoned New York City subway rider I had little trouble keeping my balance but laughing and high 5ing the locals did take concentration. Stopping for tea before arriving at Qingcheng Mountain we were treated to a tale on the history of the beverage; true story or myth, you be the judge. 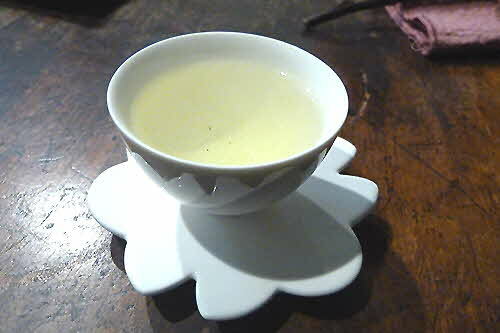 The Chinese drink hot water... not tepid or cold as we do in the west - regularly to this day (probably a holdover from when boiling drinking water was a necessity). One day some 3,000 years ago a servant of the Emperor Shennong was boiling water under a wild tea bush during a rest period from their travels. By accident a few leaves floating on the wind dropped into the pot and the Emperor found the flavor pleasing... ergo tea drinking was born... lucky for the servant. On to Qingcheng Mountain, home to many Buddhist and Taoist temples. A legend tells of Taoist Master Zhang Daoling; after years of dedicated preaching, dying on the mountain and ascending to heaven, making this one of the most famous and sacred Taoist mountains in China. There is a steep climb to a short ferry ride than a cable car will take you half way up the mountain and the last 1,200 feet must be climbed, if you want to reach the peak. All along the way are temples, palaces and pavilions to visit, spanning centuries and dynasties. A major attraction is Tianshi Cave where Zhang purportedly preached. Should you find the climb too daunting there are porters stationed along the path that for a fee will carry you before your legs give way on the steep sometimes hazardous path. 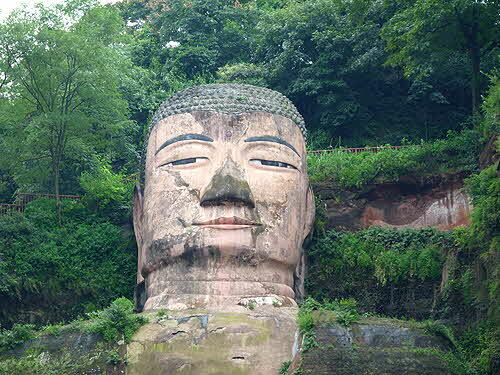 There are many historically significant sites to see in Sichuan but surely one of the most impressive is the largest carved stone Buddha in the world, the Giant Buddha of Leshan (pronounced Lu Shan). 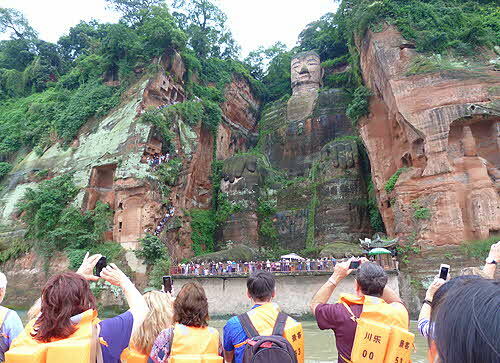 Carved into the rock face is the 71 meters high (about 233 feet) seated Maitraya or future Buddha. During the Tang Dynasty around 713 AD a pious monk named Haitong wanted to help the people who earned their living around the turbulent waters at the confluence of the three rivers: Minjiang, Qingyi and Dadu. The force of the water caused boat accidents that resulted in major loss of life... and major suffering. 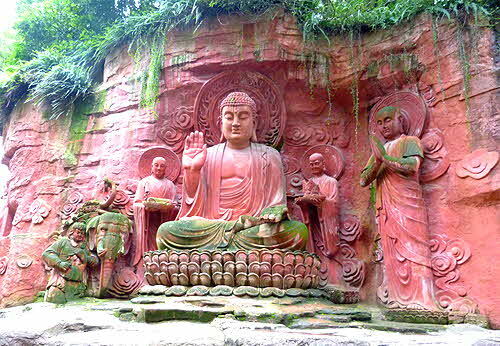 The people believed that a water spirit was responsible for their problem so Haitong convinced them that carving a statue of the Buddha would control the water spirit and consequently tame the current. 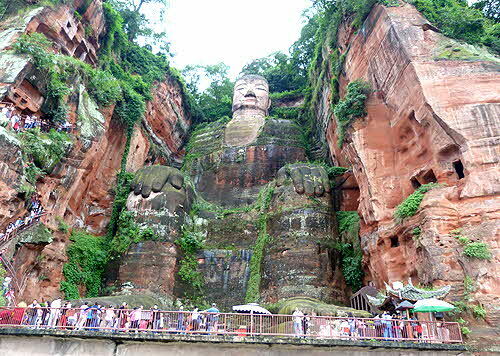 It took 20 years for Haitong to raise the money and 90 years of hard work and sacrifice on the part of the local population to carve the Buddha. The project was completed after Haitong’s death by two of his disciples but when finished the evil water spirit was gone forever. The Buddha is not only an outstanding example of architectural artistry but an engineering masterpiece and it is recognized as a UNESCO World Heritage site. There is an internal drainage system of gutters and channels scattered inside the head, the arms, and behind the ears, as well as in the clothing. This system displaces rainwater to keep the inside of the statue dry and insure internal stability. The large pair of ears - each an amazing seven meters (about 23 feet) long - are made of wood and decorated with mud Securing them to the head was indeed a daunting task for the artisans of 1,000 years ago, as was the skillful attachment of the 1,021 buns in the Buddha’s coiled hair. There are two ways of viewing the Giant Buddha, one is to get up close and personal by walking the entire length top to bottom, the other is to take a ferryboat which gives a perspective on the entire monument. Due to time constraints we took the boat but if you choose to “walk the Buddha” leave the better part of a day for the excursion. 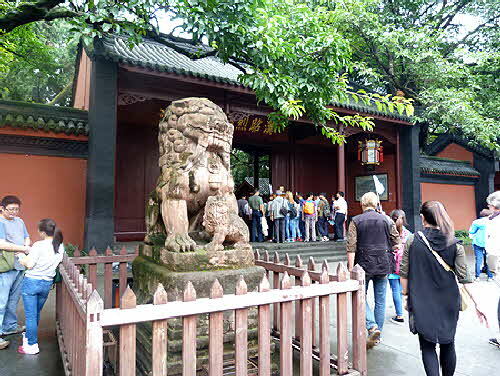 From Leshan we headed to Emeishan (“shan”�� in Chinese means mountain). There is a new modern business section of the city but as a tourist I found the authentic older section of town at the bottom of the mountain to be far more interesting. Here there are hot springs for you to ease the soreness from muscles not used to climbing mountains and yet another mountain to climb if you choose. Mt. 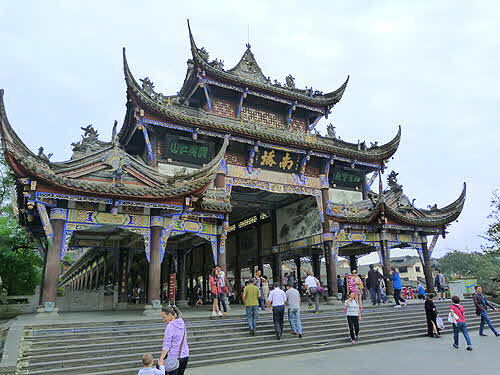 Emei is the highest one of the four sacred mountains of Buddhism. 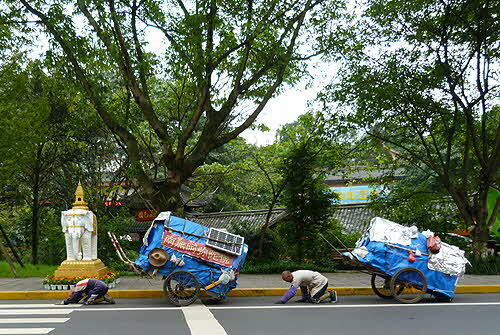 It is not unusual to see pilgrims pulling their carts filled with personal necessities up the mountain for a three to five day climb. They are required to bow every third step and prostrate themselves every fifth step and it is very slow going and painful to watch. The mountain has three sections, the bottom which is walkable but a steep climb, the middle which is climbable and has a cable car to help reach the various temples and monasteries, and the top which is a full day of hard trekking or a two hour drive to a cable car and than a short climb to reach the Golden Buddha at the peak. Once there, the air is colder and thinner but the view is dazzling... if the fog lifts. The elevation at the Golden Buddha is over 10,100 feet and warm jackets were thoughtfully provided by our tour operator as the temperature is 30 or 40 degrees cooler than at the bottom of the mountain. We had hoped to rise above the clouds to see the Buddha in full splendor against a blue sky but it was as foggy at the top of the mountain as it was at the bottom; the fog seemed so alive and sentient, I imagined that heavenly waves of mist like ballerinas dropped down to dance with the mountains. This is a holy place and the prayers that have been chanted over eons hang in the air along with the mists. The temple space under the Golden Buddha is sacred and photos are prohibited, but there are lots of photo ops in the other pavilions, and on the staircase of elephants leading to the Golden Buddha. A local show in Emeishan - Sheng Xiang Emei - is performed daily for visitors and locals alike to artistically demonstrate the culture of Mt. Emei. It’s a lovely combination of music, dance, mime and acrobatics with spectacular use of color and light, pacing and staging, with effects being used to stunning advantage. On the walkway to the auditorium there were different performing singers and dancers in national costume as a prelude to the performance. There was a cloud burst as we arrived so sadly we were not able to peruse the cluster of shops selling crafts and souvenirs outside the theater. 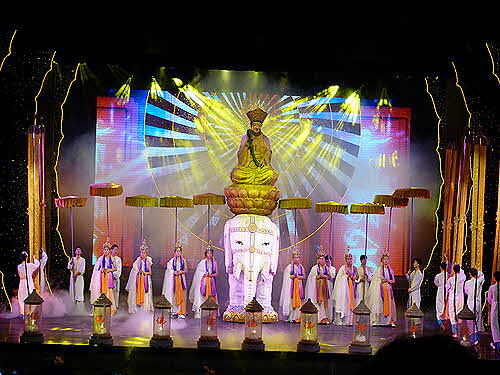 The show illustrates in eights acts the Mountain born of Mists; Grace of Tea; Naughty Monkeys; Tradition of Shu; Power of Emei Kungfu; Dreams of Butterfly Dance; and Zen of Holy Elephant. Plus, one of the most popular episodes of a Sichuan Opera “Chou Jue” about a gambling husband punished by his wife for loosing all his possessions… even his clothes. I must admit that Sichuan Province was hardly on my bucket list but now that I have had a taste of the area I can�t wait to return and see more of the ancient wonders patiently waiting for hundreds, even thousands of years to be admired once again. 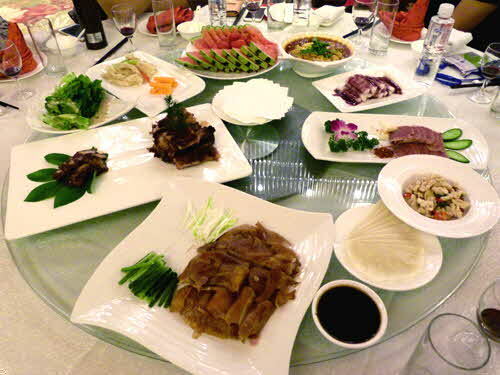 EDITORS NOTE: Unless you speak some Chinese or are visiting someone who does, traveling with a professional guide or on an organized tour is a must, if you have limited travel time. There is first-class transportation available to sites of interest, but again outside of the big cities directions are written in Chinese characters only. Even securing a taxi is difficult unless your destination and return addresses are written in Chinese characters. Many young people are learning English or other western languages but it is almost non-existent outside the large cities or in the older population. Driving in China is not for the faint of heart. There seem to be no rules of the road and its every man... or woman... for themselves. They drive with one hand on the wheel and the other on the horn. Even at night you can hear the angry honking of motorists that seem to feel the road belongs only to them. Pedestrians don’t stand a chance. Crossing the street is taking your life in your hands; it’s far safer to spend your entire visit on one side of the road (sic). There are few stop signs and yield does not exist. No Hollywood car chase scene can match for sheer brinksmanship the interaction of Chinese drivers which is strange because I found the Chinese to be generally courteous and good-natured once out of their vehicles. 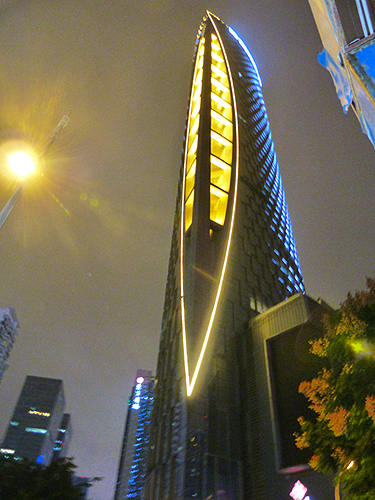 © November 2015 LuxuryWeb Magazine. All rights reserved.